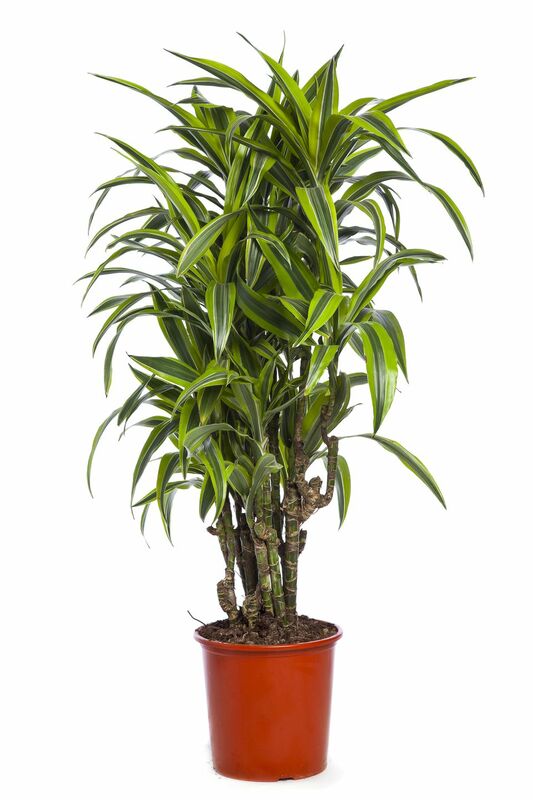 A dracaena group is a large group of plants that range from the popular and tough D. Draco to the somewhat ubiquitous Ti Trees, which have a distinctly false palm effect. Members of the Agave family, Dracaena are not difficult to grow but vary somewhat depending on the variety. There are a number of popular cultivars, including D. marginal (pictured); D. decrements (narrow leaves with margins of white or yellow); D. Draco (stiff, arching green leaves); D. reflex 'Song of India' (lime yellow margins on green leaves); D. fragrance (wide, variegated leaves with a yellow mid-stripe, sometimes called Ti Tree). Light: They can withstand light shade, especially the Ti Trees or D. marginal. D. Draco can withstand full sun. Temperature: Most Dracaena prefers warmer temperatures of 65ºF and higher. D. Draco is the sole exception, able to withstand temperatures down to 50ºF. Fertilizer: Feed weekly or biweekly during the summer, or use a slow-release fertilizer at the beginning of the season. Ti Trees can be sprouted from a section of the cane laid on their sides in moist, warm soil. Alternatively, old plants can be rejuvenated by cutting the tip and using rooting hormone. Air layering also works on larger plants. There are not generally demanding plants and will usually do well in shadier conditions than many other plants can withstand. With all but D. Draco, however, it is important to keep the soil evenly moist throughout the year—they should not be allowed to dry out—and they do not thrive in drafty, cold conditions. The most common cause of the collapse is generally too much water during the winter in combination with cold conditions. If the plant begins to show brown leaf margins, raise humidity by misting regularly.